EMMA, Joseph D. Emma MD of Avon, passed peacefully at his home on Friday March 29, 2019 at the age of 67. For over 30 years, Dr Emma's practice has welcomed people from all over the globe. His flag-emblazoned office has seen generations of families pass through Avon. Dr Emma grew up in Avon and, after graduating from Thayer Academy and Ricker College, completed his doctoral education at La Escuela Medicina at Universidad De Guadalajara in Jalisco, Mexico. 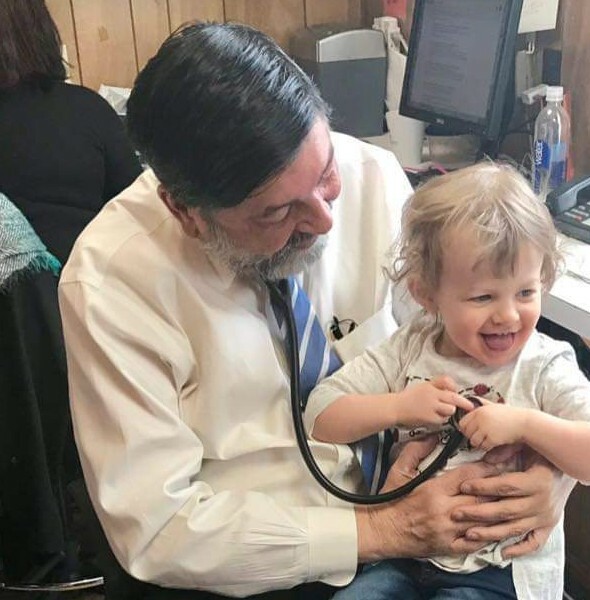 After medical school Dr. Emma returned to his hometown, assuming Dr. Jacobsen’s practice and keeping a century of continued family care alive. Previously described by a local reporter as “fast-talking & flamboyant,” Dr. Emma's inimitable style and peppery & always irascible language was loved by all. His fluency in Spanish made the growing Latino population on the South Shore comfortable in his office, bringing quality and compassionate care to a previously underserved community. He saw families spanning from Gloucester to Fall River and would not accept payment from people he knew did not have the means. Dr. Emma loved his staff and his patients with unrivaled fervor. The compassion Dr. Emma felt for his patients emanated from a deep reservoir of love that was filled by his mother and father. He shared the love with his children, his nieces and nephews, and his young grandchildren. Dr Emma’s children fondly recall weekend sleepovers with cousins at “Uncle Joe’s” that were always magical events filled with games, movies, comic books, and staying up too late. Vacations involved extended family as well - seven children lined up at the airport, backpacks in tow. These young adventurers were guided on countless trips including Mexico, Jamaica, Texas, and New Orleans. his unyielding love and support. There was no problem too big or issue too small that you could not bring to him. He was always available to listen and would respond with understanding, guidance, and encouragement. Family was the center of his life. Dr. Emma is survived by his wife Mary (O'Neill) of Avon; his friend and former wife Carol Fortier of Braintree; son Anthony Joseph of E. Bridgewater and his wife, Robin; son Jonathan of Easton and his fiancee, Alyson; son Christopher of Boston; stepdaughter Dr. Corrie Marinaro of Maine and her husband, Jeffery Lucas; stepdaughter Katelyn Pascuzzi of Oklahoma and her husband, Stephen Feemster; siblings Ronald of Bridgewater, Jeanna Chivaroli of Easton, Ferdinand of Connecticut, and Micheal of Texas; beloved granddaughters Lluisa and Caroline; countless cousins and dear friends. A Funeral Service will be held Saturday, April 6th, at 10:00 AM in the Cartwright Funeral Home, 419 N. Main St., Randolph MA 02368. Relatives and friends are respectfully invited to attend. Visiting hour Friday, April 5th, from 4:00 to 8:00 PM in the funeral home.